Important note: Igor32 has made the discovery that sometimes TOM files and TR4 files can become saturated during repeated output of WADs and subsequent conversions. If your level is causing problems, first try deleting the TOM file and the TR4 file, output your WAD again and convert into a fresh TR4 file before attempting any of the possible fixes below. This has been known to cure a number of problems. The load bar goes right to the end while loading your game and then crashes. Don't laugh, but is Lara in your level? It's easy to take her out then forget to put her back. If there is no Lara in your level, your game will crash at the end of the load bar. Is it a Script Problem? The game crashes while loading. Is it a script problem? The easiest way to tell is to put the original script and english DAT files in and test. You may have to rename your TR4 DATA level file to one of the originals for this exercise. If your level plays fine, you will then know it is a script problem. Always keep a saved copy of working script and english text files. If things go wrong, which they always do, it is then easy to go back to your last saved working copies. If they don't work either, you will then know it's not a script problem and can look elsewhere. If going back to old scripts makes your level work again, make your new script changes one at a time and test each one. You will eventually find where it's going wrong and be able to isolate the problem. Your level has been working fine and converting fine and playing fine, but now it's crashing. One possible cause is having too many light bulbs, flame emitters, other nullmeshes, and cameras in one room. The manual says you can have over 30 of these items per room, but I've had crashing problems with just 19 or 20. This can often occur when adding cameras while finalising your level. You may have a room that is borderline with light bulbs and flame emitters etc, around the 20 mark, and it's working fine, but then you add a few flyby cams and the game starts crashing. Sometimes deleting a lightbulb or two can solve the problem. If you're way over the limits though, you may need to split the room into 2 or even 3 sections and join them up again to get back within limits. If a room is borderline, the game may even start up and you only crash when you actually enter the borderline room. If this happens in game, check that room in the editor and delete 2 or 3 light bulbs or flame emitters to see if that solves the problem. One possible cause is having objects lost in cyber space. Check the Error text file in the TRLE root folder. If it says objects are in a room but they're not in that room, it means you have bounded a room (cut it down in size) while there were still objects in the deleted part of the room. The editor unfortunately doesn't bin these objects from the level, it loses them, and they cause random crashing. The only fix I know is to go back to a previously saved PRJ file before you bounded the problem room, and rebuild from there. BE EXTREMELY CAREFUL THERE ARE NO OBJECTS OR LIGHTBULBS IN THE PARTS OF ANY ROOMS YOU WILL BE BOUNDING. Audio files in the wrong format can cause your level to randomly crash in game. A level can crash and yet still play. If you find that switches and puzzles work when you start a level, but they don't work later on, there is a good possibility the level has crashed. I've met this one a few times and it is a real pain in the neck as it can take you hours of testing to get to the end of your level only to find that what was working earlier no longer works. You check the PRJ file and everything looks perfect. You start the level and DOZY on over to the switch/puzzle and test it and it works perfectly. Then you play through the whole level again and when you reach the problem switch/puzzle, it doesn't work. Your level has crashed. The fix is simple. Split the level into two. If you don't like that idea, try cutting down on too many varied textures in rooms. If that doesn't work, delete all the unused objects in your WAD. If that doesn't work, try deleting a few objects from your level. If that doesn't work, try deleting a room or two. If that doesn't work, you need to split your level. If it all works after splitting, then you will know what caused the problem. It might be a good idea to try splitting your level first, to see if that is indeed the cause. Always remember to have backups of everything. If you've added a whole load of objects to your WAD and now your level is crashing, there is a probability one of the objects is the culprit. An easy way to check is to rebuild the WAD item by item and test your level after adding each new object. You will soon isolate the problem object and be able to modify it or bin it. This might take a bit of work, but sometimes it's better than binning the WAD and starting from scratch. Besides, if you add the bad object again, you'll have the same problem, so might as well isolate it and bin it. If the screen suddenly turns black when playing your level, and the little light on your computer goes out, don't panic, just wait until the electricity comes on again. If your game crashes while level jumping, and the scripts and finish triggers are definitely set up properly, and both levels play fine by themselves, the cause is usually having a different Lara object. You need Lara to have the same animations in both levels for the jump to be successful. If, for example, you give Lara a new weapon in one level, you will need to give her the same weapon in the other level. The only way round this (if you have to use a different Lara) is to use the ResetHub command in the script. Ahhhh, there you go eh. My second level has been expanded to 151 rooms, and the damn thing just crashed at load. First thing I did was check all my texture tiles and binned any I wasn't using. Did that, but the level still crashed right at the beginning of the load bar. Next, I went through my WAD and removed everything not in the level. Did that and the load bar got to half way before the level crashed. A ha! We're getting somewhere. What else can I bin? Checked the map and found two rooms I could bin straight off which didn't affect the game or gameplay. Did that, level still crashed half way through loading. Hmmm, something else has to go. Oh dear, it's going to have to be one of EssGee's new puzzles. Hmmm, but I love both of them. Ah, but one of them also has a static object, so if I bin that one, I'll be able to bin the static too, saving more whatever it is the editor needs saving on. Binned it and the static and the load screen went right to the end, took a breath and . . . crashed. Damn. Hmmm, but we're almost there. Something else has to go. Oh well, I didn't particularly like the first area anyway. Binning that gets rid of 3 rooms plus 3 flipped rooms, plus the mine object, two switches, and a few other objects. Removed the mine object from the WAD, binned the rooms, loaded the game and . . . it WORKED! The editor isn't something you can regulate regarding limits. You can be way over one limit but way under other limits and the game will play. It's a delicate balancing act. If you do get a broken level working again like this close the thing down before it breaks again. If it's still growing, start another level. You're been playing your level but when Lara dies you crash. Another cause of random crashing is having all the available object slots filled up. 9 slots MUST be left free for animations. Then "Cannot find texture file..." and then the editor crashes and closes. There is a space in the file name for your texture set. Simply delete the space it and it should work. The Editor will not recognise spaces in texture set file names. Improperly placed trapdoors can cause your game to crash or freeze. The correct way to place a trapdoor is to place it on the ground in the room below and raise it up into place. It MUST be EXACTLY raised into the portal between the upper and lower rooms. Please note that if any other part of the ceiling of the room in which the trapdoor is placed is lower than the trapdoor itself, it will cause you problems. Also, placing the trapdoor on the floor of the room above will cause the trapdoor to disappear from view in game when viewed from certain angles. Trapdoors can be placed below room portals if you use dummy triggers below them so Lara can stand on them, like the bridge objects. Trapdoors can also cause crashing and other problems if placed in flip maps when the rooms have been flipped. If your editor is crashing while using draw doors and zooming in and out, check your screen resolution. Make sure you're running at 1024 x 768. Sometimes this is unavoidable in huge areas with zillions of texture infos and objects in view in the editor window. If your level reaches such a size you will just have to complete it without using draw doors unfortunately. I recently installed a fresh editor, loaded in all my game files and everything worked perfectly, but when I outputted the WADs of my levels in the new editor they all crashed while loading from the title screen. 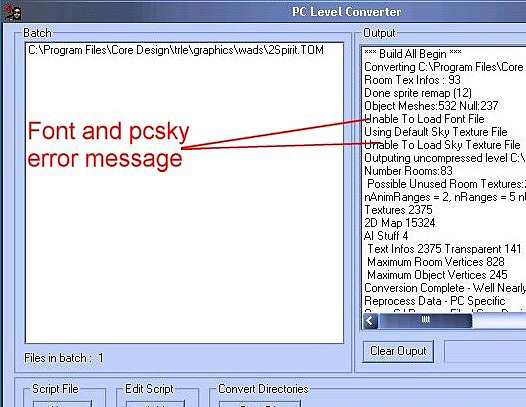 I eventually found the problem was due to not having the font.pc and pcsky files in the graphics/ wads folder. If these files are missing they will generate an error message in the converter too. To fix all you need to do is copy and paste the originals into the graphics/ wads folder. 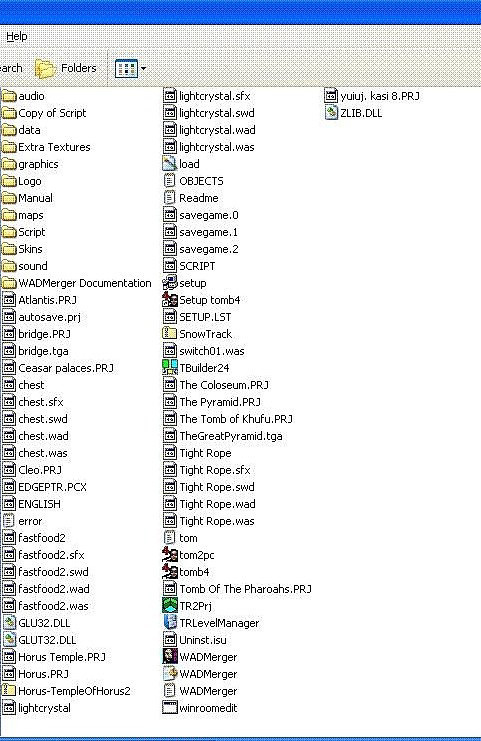 This is an example of what not to do in your TRLE root folder!! The editor has to search the root folder for files it needs to operate smoothly. If you clutter the root folder with rubbish, like in this example, don't be surprised if your editor throws a fit and refuses to work. Having too many different textures applied in the same room can cause crashing. Try to be as sparing as possible with using different textures. Having 8 rooms 8 x 8 x 4 joined together and stacked into one big room 16 x 16 x 8 will cause far less problems for you than having one huge room that size. And let's not forget the flare bug. If you use the light on the binoculars and your level crashes to desktop in game, you've activated the flare bug. You can recognise the flare bug when Lara lights a flare, but it doesn't work unless she chucks it away. Simple solution is anti-trigger your flame emitters. It's a good idea to get into the habit of anti-triggering all flame emitters in areas Lara has completed and won't be returning to. If the Level Converter gets to Room Text Info and then crashes to desktop, your WAD is overfull and needs trimming. If you are using the TRNG and the converter crashes to desktop, this is usually due to the animations ranges requiring to be reset. Open your Animation Ranges dialogue box, press the R button to Reset all your animation ranges and save. Your level should convert now, but you will need to set your animation ranges again. This can also occur updating to newer TRNG versions. Some switches, like the underwater switch, can crash or freeze your game or mysteriously trigger flyby cams if there are no triggers placed on them.